Oh boy, where do I begin? I’m in a post-travel funk. It’s hard to get back to work and home after even just 2 weeks away. 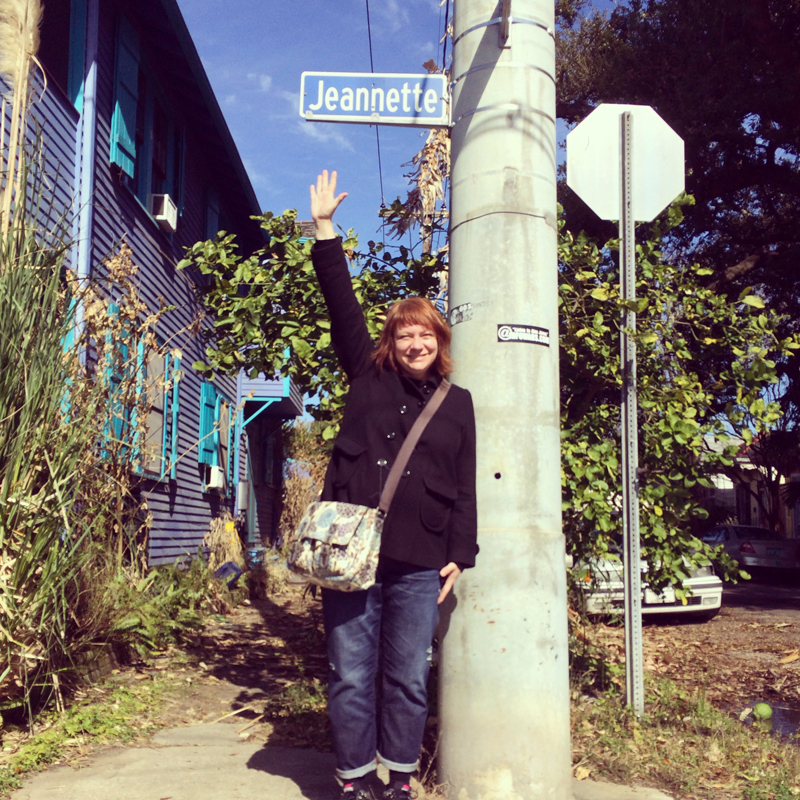 First off, New Orleans is a wonderful city: highly walkable, enjoyably bike-able and the people are beyond friendly. Maybe it’s the South or maybe it’s just New Orleans, but I’ve never chatted with so many strangers ever. It made the city feel warm even when the cold winds were biting and sharp. Bywater, our home base, was a charming neighbourhood were we felt completely safe walking and biking around at all hours. Late night runs for slices and amazing salads at the rightly named Pizza Delicious were consumed on more than 3 occasions. Shrimp and Grits and amazing Bloody Mary’s at Elizabeth’s. Biking to City Park, wandering the Sculpture Garden and enjoying cafe au lait and the best beignets at Morning Call outside in the sunshine. A bike ride through Treme to Mid City to split a delicious roast beef & fried shrimp covered in gravy Po’boy at Parkway Bakery & Tavern. An oh-so-delicious lunch and lemonade at Boucharie on Jeannette Street (my namesake street!). Much needed greens and colour at Green Goddess for an early dinner in the French Quarter – perhaps my favorite meal of the trip. Old Bud Rip’s Ninth Ward Bar with it’s tin ceiling and long shiny wooden bar for smokey good times and the best jukebox. A sandwich at Wayfare on Freret Street that I will try my darndest to recreate in my own kitchen. Wooing and petting feral cats. Wandering through the deserted streets of the French Quarter during the dreaded and nearly laughable “sneauxmageddeon”. A free ferry ride across the brown waters of the Mississippi River to Algiers Point and the resulting bike ride along the levee on a summer-like warm day where we ended up at a British Pub with a Tardis entrance and ate homemade pickled curry eggs & seed bread from a friendly patron who lived around the corner. Seeing great live bands on Frenchman for the cost of a few beers and a few bags of Zapp’s chips (must get ahold of more Voodoo flavour chips!). New Orleans was an experience and though we wished for warmer weather, we loved every single minute. Downsides? Well, the Bywater for all its amazingness is a food desert and we found it difficult to get good produce. Also, finding good coffee and beer was a bit more difficult than it is here in the Pacific Northwest, but we know we’re spoiled for those riches out here. And drink prices were about the same as Vancouver, which was a little shocking. Still, I’d return in a heartbeat. New Orleans, you charmed me up good. The bonus about being away and not cooking for two weeks is that I got excited to cook and bake in my own kitchen again. A blueberry and apricot baked oatmeal was enjoyed on our first morning back home. The other night, I made an incredible batch of fruit and nut and chocolate cookies that I’ll post about soon. And for dinner one evening, I braised some lentils and sausages and potatoes with wine. Cozy, wintery and heartwarming food to feel like home. And yet, for this post, I’m sharing a cake that I made last month for my husband’s birthday. His birthday is smack dab after New Year’s so we held off to make the cake until mid-month when we felt like eating chocolate again. But this is no ordinary chocolate cake. It’s gluten-free and made with…dum dum dum…cooked quinoa. I know, weird, right? Despite some trepidation from the birthday boy, it was well-received. Super dense, moist and deeply, darkly chocolate and topped off with a cream cheese peanut butter frosting. Not healthy in the least which is how a birthday cake should be. Starting to bake a cake by cooking up a cupful of quinoa seems weird, but trust me, cook up that quinoa. When it’s all cooked (in water, not broth, duh!) and then cooled, you dump it into a high-power blender. 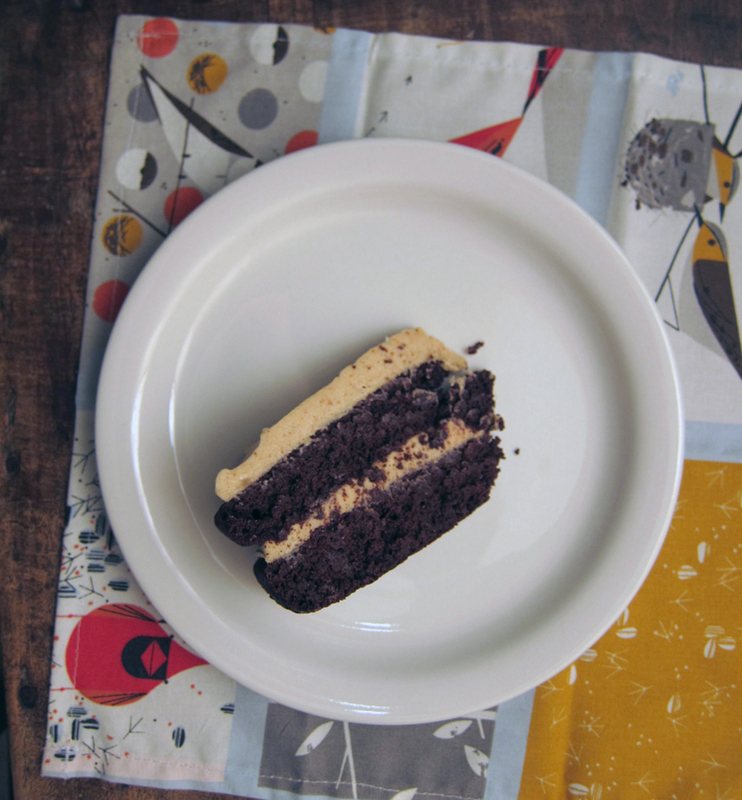 Using a food processor or a weak-willed blender won’t cut the mustard on this cake. You need the power of a fancy blender to whizz and whirl those quinoa seeds into a smooth (or as smooth as you can get it) slurry. Once baked, the cake doesn’t get a super high rise, in fact, it looks a little dumpy and sad–at least mine did – but I blame that on using 9-inch cake pans instead of 8-inch ones–but add a slather of frosting, put on some candles if you’re celebrating and go with it. It’s chocolate cake and it’s delicious. The texture of this cake was a little lumpy since it’s really difficult to blend every little bead of quinoa, but the quinoa wasn’t hard and if you didn’t know that there was quinoa in this cake, you wouldn’t suspect a thing. But I impress you to use a high-powered blender. My husband bought me a Oster VERSA 1400-watt Performance Blender as a Christmas gift and it worked like a charm. I wouldn’t use a food processor or a cheapo blender for this cake, you just won’t get the right texture. Cook your quinoa according to package directions (erring on over-cooked & mushy over underdone), and let cool. Preheat oven to 350F and butter 2 8-inch cake pans. Dust pans with cocoa powder and set aside. Add milk, eggs, and vanilla and blend on high in your high-speed power blender until combined. Add in the cooled quinoa and the melted butter and blend well until smooth. In a large bowl, whisk together the sugar, cocoa powder, baking powder, baking soda and salt together. Pour in the blender contents, and stir until just combined with a wooden spoon. Divide batter evenly between the 2 pans, smoothing out the tops so that they look even. Bake for 25-30 minutes or until a cake tester inserted in the centre comes out clean. Place cakes on rack to cool for 10 minutes before removing cakes from their pans to cool completely on the racks. 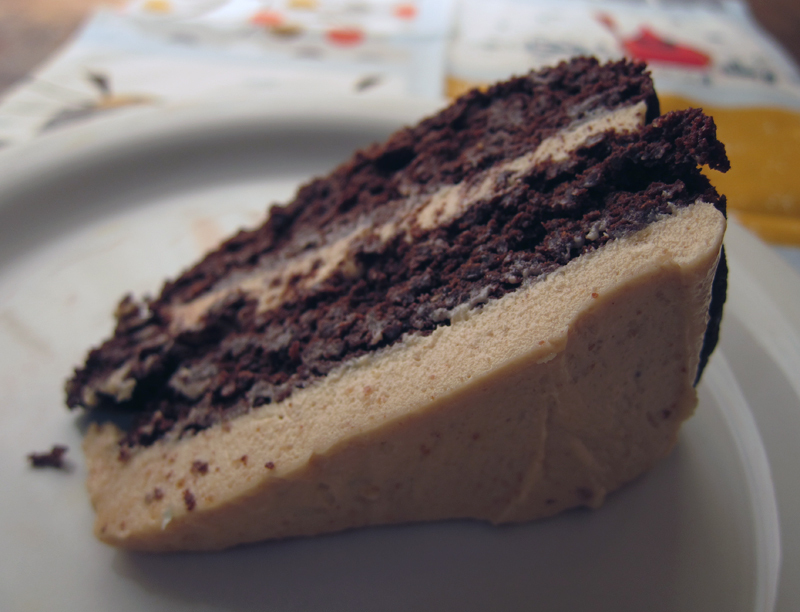 When cool, frost cake with peanut butter frosting, recipe below. Whip the cream cheese, peanut butter, salt and vanilla together. Stir in the powdered sugar, 1 cup at a time, adding a little milk to smooth out the mixture. Blend until fluffy. Spread onto cooled cake. Ooh! 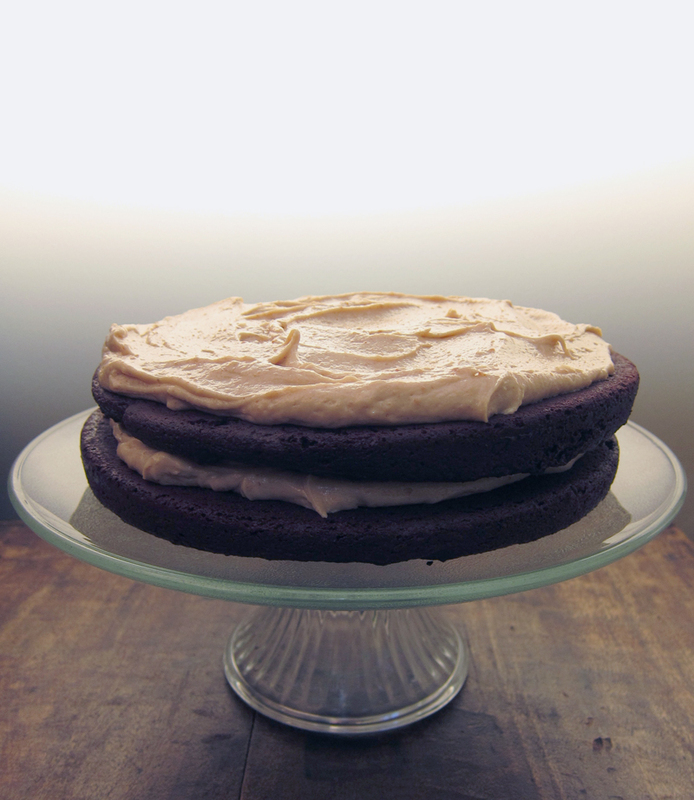 To any doubters, I’ve made chocolate quinoa cake and I can vouch for its awesomeness. Your trip sounds dreamy. Did your packing work out? Oh goodness! This sounds amazing. And love that charley harper placemat too. So glad to hear you had fun in NOLA! It’s such a great place. This cake looks fabulous – sometimes the dumpy looking cakes taste the best! I’m also really intrigued by the quinoa – I don’t have a high-powered blender though (just a food processor and a magic bullet), so I might have to hold off on making this until I get one. Your trip to New Orleans sounds fantastic. It’s so hard coming home after a great holiday. I’d never have thought of quinoa in a cake before. Can’t wait to give it a try, it looks too good. I’m glad you had a good time on vacation! I’ve never been to New Orleans, but Charleston and Nashville were both friendly places, so I do think it’s a southern thing. You’re right, it is very hard to get back to reality after vacation, but this cake looks like just the thing to get back in the kitchen for. Looks wonderful! Your trip to New Orleans sounds fantastic! I enjoyed living vicariously through you with your Instagram pics 🙂 This cake sounds amazing! It’s always a good time for chocolate in my world lol…and cake too! I’ve yet to try baking with quinoa but I picked up a bag of millet flour at the health food shop the other day. Thinking of making dog/human cookies. Amanda, could be true about dumpy cakes – I mean this one sure wasn’t a looker, but it tasted pretty great. You can try without a high powered blender, but when I looked at comments on the original recipe site, there seemed to be much complaints about texture. Nicole, it must be the South, then 🙂 I need to explore it further. Thanks JoanneM! This cake is pretty good, I’m sure you’d love it. I made this for Valentine’s day–we loved it! And the frosting was the cherry on top. You’d never know that there’s no flour and made with cooked quinoa. Thanks for the recipe! Gillian, so glad you loved it – a perfect cake for Valentine’s day!! Cherylinaj, well, the Black Magic Cake is my most favourite chocolate cake ever, so I think you picked a good one 🙂 And glad you tried this frosting…decadent perfection indeed! Wow. I bet this is fabulous. 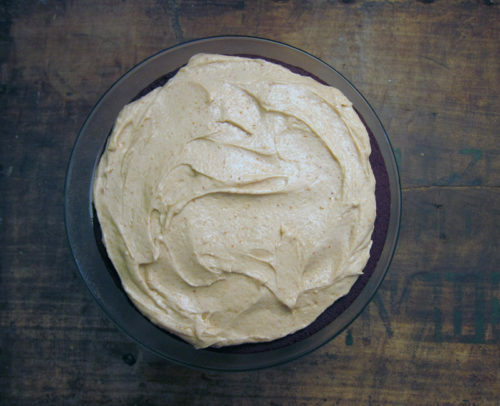 I will be dreaming about that frosting until I have time to make it. This looks yummy! Would you be able to make this cake as cupcakes? Katelyn, I don’t see why not, just bake for less time in the oven.